Buyers often judge the capability and versatility of a full-size pickup by the numbers. Not just dollar figures, but power numbers, towing numbers, bed length, how many transmission speeds it has and how many different configurations it offers. The 2013 Chevrolet Silverado 1500 delivers all the right numbers, starting with its five-year/100,000-mile limited powertrain warranty – 40,000 more miles of powertrain coverage than you get from the Ford F-150. For 2013, the Silverado MSRP starts at $22,595, $1,075 less than the $23,670 MSRP of the 2013 F-150. The Silverado offers five trims (WT, LS, LT, XFE and LTZ), three cab styles (Regular, Extended and Crew Cab), three cargo bed lengths (five-feet eight-inches, six-feet six-inches and eight feet) and two-wheel or four-wheel drive. If that’s not enough, Chevy also offers the completely unique Silverado 1500 Hybrid – the industry’s only full-size hybrid pickup. With a 6,100 pound towing capacity, the 1500 Hybrid delivers segment-best fuel economy EPA-estimated at 20 mpg city and 23 mpg highway. The Silverado offers five powerful and efficient engine choices – a Vortec V6, and four Vortec V8s built on 57 years of V8 research and development and proven over billions of miles of driving. The V8 lineup delivers advanced technologies like Active Fuel Management (AFM) and Variable Valve Timing (VVT), and all non-hybrid Silverado V8s are FlexFuel capable, allowing buyers to run on either gas or E85 ethanol. The capable 4.3-liter V6 is good for 195 hp and 260 lb/ft of torque. The first V8 is a 4.8-liter with VVT rated at 302 hp and 305 lb/ft of torque. The V6 and the 4.8-liter V8 come with an electronically controlled Hydra-Matic® four-speed automatic transmission. A 5.3-liter VVT V8 comes in both iron block and lighter, aluminum block versions, both delivering 315 hp and 335 lb/ft of torque. Active Fuel Management allows both 5.3-liter V8s to run on four-cylinders under light load conditions, such as highway driving, for better mileage. The flagship Silverado engine is an aluminum-block 6.2-liter VVT V8 that cranks out 403 hp and 417 lb/ft of torque. All 5.3-liter and 6.2-liter V8s are paired with six-speed automatic transmissions featuring powertrain grade braking, a new technology for 2013 that automatically downshifts the transmission on long, steep descents, reducing brake rotor temperatures more than 200 degrees. Not only is every Silverado engine option powerful, but the 5.3-liter V8 returns an efficient 21 mpg highway in both 2WD and 4WD models and 22 mpg highway in the more aerodynamic Silverado XFE. In addition to powertrain grade braking, the Silverado 1500 is tailor-made for towing, featuring standard StabiliTrak Electronic Stability Control, Trailer Sway Control, Hill-Start Assist and transmission Tow/Haul Mode, and options like Trailer Brake Controller, which is fully integrated with the antilock braking system, a rear-vision camera and the MAX Trailering Pack that enables the Silverado to haul a massive 10,700 pounds. The Silverado also features a maximum payload capacity of 1,937 pounds. Five available suspension systems give you the flexibility to tailor your Silverado to suit your needs, whether you need maximum on-street performance, off-road capability or serious towing capacity. In all cases, a coil-over shock front suspension and rack-and-pinion steering offer a superior ride and precise handling and control. A fully boxed frame with a hydroformed front section gives the Silverado superior rigidity and strength. Further adding to the capabilities of the Silverado, a GM segment-exclusive automatic locking rear differential is standard on XFE and LTZ trims and available on the others. The 2013 Silverado builds on nearly a century of heritage by featuring a rugged-yet-sophisticated exterior look that fits in equally at the work site or downtown. A range of 17-, 18- and 20-inch wheels are offered, as well as 10 exterior color choices. The list of standard and available exterior features on the Silverado is extensive, and includes foglamps, heated outside mirrors, a spring-loaded EZ lift and locking tailgate, and chrome accents on exhaust tips, recovery hooks, door handles and mirror caps. The Silverado features four interior color and trim combinations and two interior designs; the traditional pickup look or the luxurious LTZ package. While the traditional interior features larger controls and door handles that are easy to operate with gloves, the LTZ has a unique, upscale instrument panel and distinct trim accents. The Silverado boasts standard and available options commonly found in luxury cars including leather-trimmed upholstery, heated and cooled front seats, 10-way power-adjustable front seats, navigation, Bose premium audio, a rear-seat entertainment system, Bluetooth hands-free phone connectivity, a power sunroof and remote vehicle starting system. If you wish, you can even turn your Silverado into a mobile hotspot with the available Chevrolet Wi-Fi by Autonet Mobile. Enjoy dependable internet access for multiple users up to a 150-foot radius from your truck. An elevated, 60/40-split rear seat with one hand operation comes standard on all Crew Cab models (available on Extended Cab) to help maximize interior cargo and passenger space. Extended Cab rear access doors have 170-degree entry operation for easy rear-seat access. 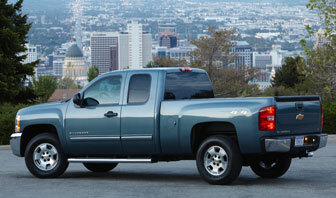 With all the right numbers for power, efficiency, capability and value, the 2013 Chevrolet Silverado is hard to beat. With so many drivetrain and build configuration options and all the latest technology, you can outfit a Silverado exactly to your needs. Visit our showroom today for a test drive of the 2013 Chevy Silverado. 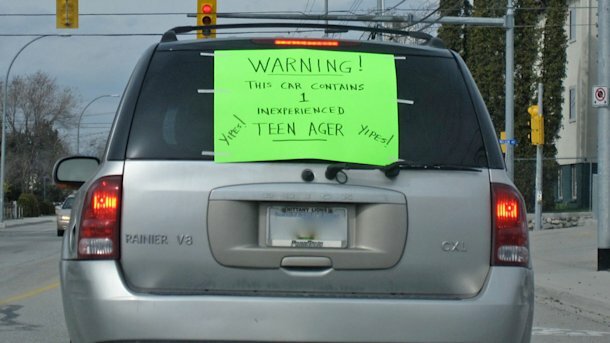 What Kind of Vehicle is the Safest for Your Teen? Giving a set of keys to a teen-ager can flood the parent of even the most cautious new driver with fear. Now a new study shows that the safest kind of vehicle for teen drivers might be a big sport utility vehicle. The research comes from the Highway Loss Data Institute, a firm run by insurance companies to find ways of reducing crashes and deaths. Using five years’ worth of insurance claims from 2005 to 2010, the HLDI compared the collision rates between adults drivers between 35 and 60 years old and teen drivers between the ages of 16 and 19. Regardless of the kind of vehicle involved, the HLDI logically found that teens had accidents at a higher rate than adults. For the sliver of teen-agers who somehow find their way to the seat of a supersport motorcycle, the institute found they were more than four times as likely to get into a crash than an older driver. In vehicles with four wheels, teen drivers were up to 2.5 times more likely to have an accident in sports cars. What surprised researchers was that the crash rate for teens in small cars of all types was still much higher than average — roughly twice as high as adults in the same vehicles, and only slightly lower than the rise of driving a regular motorcycle. Kim Hazelbaker, senior vice president of HLDI, said in an institute report that small cars may be less forgiving in sudden maneuvers, or that teens may be encouraged to take more risks due to the car’s size. The lowest risk vehicle for a teen driver? Large and luxury SUVs, where the crash rates for youths were as little as 10% greater than for adults, and posed a lower crash risk than all but the largest cars. The reason for the gap? Technology. The HLDI study analyzed claims from vehicles newer than the 2006 model year. By that time, large SUVs came standard with electronic stability control — systems that keep vehicles from skidding in emergency maneuvers which has been shown to drastically reduce crashes — while in many cars the tech was still an option, especially smaller, cheaper models that teens often drive. As of the 2012 model year, all vehicles sold in the United States are required by law to offer ESC standard. Other HLDI studies have shown newer SUVs also do a better job of protecting passengers from injuries and death in crashes than smaller cars and pickups. It defies parental logic to think the safest ride for a 16-year-old might be a two-ton truck, and no vehicle can keep all reckless drivers from harming themselves or others, but for some teens the best answer to driving safely may be to go big.